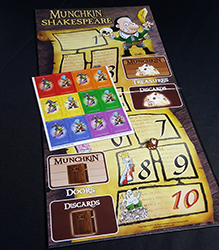 The stage hands have been hard at work, so we've got new tooling samples for Munchkin Shakespeare to show off! 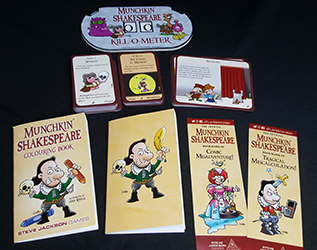 This past week, we received samples for Munchkin Shakespeare Deluxe, Munchkin Shakespeare: Limited Engagement, and the various accessories. These are not final, but show where the printing process is at, and gives us an idea of what the end product will look like. We unboxed the set live on Facebook as well, where we went through a few more of the cards. Two Bees, or Not Two Bees? Why not both! 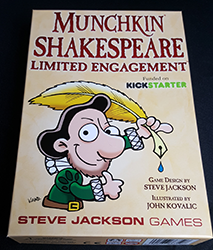 We'll be unboxing Limited Engagement on a future stream, so make sure you like our page to stay informed. 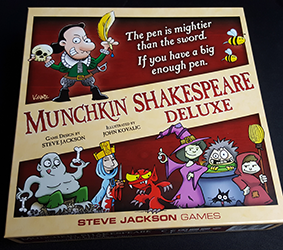 Look for Munchkin Shakespeare Deluxe this September. 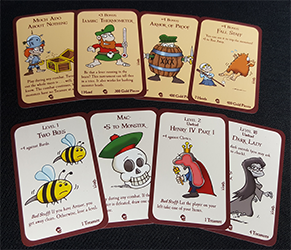 We'll be delivering first to backers, and shortly thereafter, it will hit store shelves!